Dentistry is a competitive business and patients in most cities have endless options when they’re choosing a practitioner. Attracting new patients requires a competitive edge. Now, more than ever, it is essential for your practice to be visible online. Patients aren’t just asking their friends and families for recommendations – they’re taking word of mouth to a whole new level. Before deciding on a dental care provider, new patients spend time researching their options by reading reviews and surfing competing websites to find the best dental service provider that meets their unique needs. This is particularly true for young families, Gen X’ers and Millennials who are in the market for dental services. If they can’t easily find your practice online, they’ll choose one of your competitors who is already front and center on the web. Are there dental practices in your area that are thriving and growing quickly? Do you want to see that type of growth for your practice? These competitors are leveraging digital marketing and search engine marketing to fuel their growth. Whether you’re a specialist or a general practitioner, your website is second only to referrals as the main source of new patients. Are website marketing issues holding your practice back? How can you ensure that your practice is visible and easy to find? 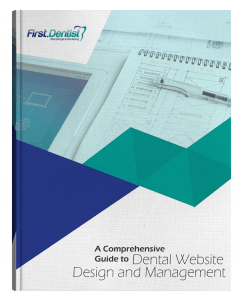 As a hard-working dentist, it can be difficult to find the time to address the website marketing issues that are holding your practice back from the growth you deserve. You might find that the websites of your competitors appear higher in search results, but you don’t know how to improve your own rankings. Or you might discover your website isn’t attracting significant numbers of new patients, even after hiring a web marketing company to help. For most dentists, time and tactical knowledge are the factors limiting their marketing success. That’s why we started First.Dentist’s tailor-made search engine marketing services. We take the most important and time-consuming technical tasks out of your hands and place them in the trusted hands of seasoned SEO professionals. Our CEO, Ross Dunn has been providing local search marketing professionally since 1997. Ross hosts SEO 101, a bi-weekly podcast recently acclaimed as a top 10 SEO resource by Hubspot. SEO 101 is in its 7th year. Ross is the guy who professional SEOs tune into to stay current. His team has managed SEO for hundreds of local businesses since 1997, so you know we’ll help you rank well in the search results and keep you there over the long term. We know you’ve worked countless hours to become a dentist and build your practice, and you should be proud of all you’ve accomplished. Next to referrals, your website is paramount for growing your practice and requires professional, specialized attention. If your website isn’t generating the desired stream of new patients, digital marketing experts like First.Dentist can help. First.Dentist handles the specialized technical work such as code and schema markup, and the time consuming tasks such as link building and creating content that are necessary to get and keep your website ranking well. By working with an experienced, professional web marketing company you can rest assured that your website and digital marketing efforts are attracting new patients. This peace of mind will free you up to focus on patient care, building your team and spending more precious time with your family. We use industry and proprietary tools (Screaming Frog, SEMRush, Moz.com, etc.) to analyze how SEO updates are affecting your website’s rankings in the organic and local map-based results. We also monitor Google Search Console (formerly Webmaster Tools) and Google Analytics and fix all current issues. Google rewards fresh, unique content that is added on a regular basis. New content builds search engine authority. First.Dentist creates a 500-700 word article on your website each month as part of our SEO strategy. We will ask you to review and edit the content before posting it on your website, so you’ll know it’s high-quality. You can enjoy the comforting feeling that an industry leading SEO company is continuously monitoring your website to ensure it is at the top – or on its way to the top – of the search engines. You’ll have a dedicated account manager who will check in with you regularly and arrange quarterly meetings to assess your progress. First.Dentist will position your practice in the best light possible to help you attract ideal new patients. All services are provided in-house by First.Dentist and clients receive monthly reports with detailed feedback on how to improve digital marketing results to attract more new patients. Our goal is to quickly help our clients outrank their competitors so they can attract the best new patients in their city. Call us today to book a complimentary marketing session that looks at your practice’s current online presence and provides a digital roadmap for attracting new patients to your practice.